Deck Bird Feeder Poles are great hanger arms to hold bird feeders off of your deck and give a close up view of Backyard Wild Birds. 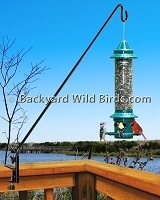 We have a large selection of Deck Bird Feeder Poles that work with different style of decks. There are 3 basic mounting styles to choose from: Railing Clamp mount, Screw mount and Baluster mount. A lot of Deck Bird Feeder Poles clamp onto a standard 2x4 railing. Some of the special Deck Bird Feeder Poles use screw mount bracket arms or wide clamps to mount to deck for more flexibility. Baluster mount deck poles can provide a solution when complex deck and railing shapes don’t allow other styles because they attach to vertical balusters and not to railings. 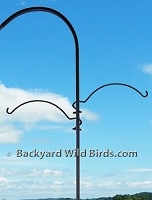 For more detailed info on the various styles see our Birding Info article Deck Bird Feeder Poles Styles. Deck Poles go nice with our squirrel resistant metal Sunflower Seed feeders to attract a large variety of birds. 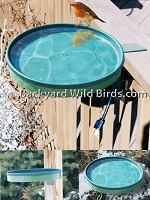 Hummingbird feeders and Thistle Seed bird feeders are also very popular on deck poles. Deck Bird Feeder Bracket Arm hangs bird feeders in style. 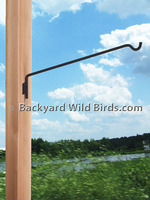 Bird Feeder Bracket Arm pole is a swing arm extended 36" reach Deck, Wall, or Post screw in bracket. Deck Bird Feeder Pole Duo Adjustable is a deck bird feeder pole with two independently adjusting swing arms. This a screw mount pole for deck, fence or wall hanger arm with 42" overall height and 17" reach. Deck Bird Feeder Pole Screw Mount is a fixed bracket arm that screws directly into a deck vertical section. The 36 inch tall Forged Curved Bracket is made from strong 1/2" square steel and makes a very nice deck, post or wall display. 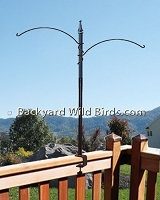 Deck Bird Feeder Pole Two Arm is a deck bird feeder pole with two 16" adjustable hanger arms. This 36" tall 1" diameter deck pole mounts on a deck railing that is less than 2“ thick. 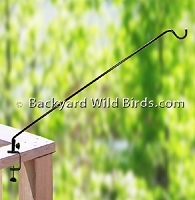 Deck Bird Feeder Pole Wide Clamp is made to hang bird feeders on a wider than standard 2” deck railing. The deck bird feeder pole is a swivel shepherd staff with 12” reach and a large wide mouth clamp only for railings that are from 2" to 5.5" thick. 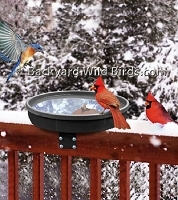 Deck Bird Feeder Swing Arm is a perfect pole to put your bird feeders off of your deck. The brass cap bird feeder bracket arm has a swing arm with deck clamp mount. Deck Pole Adjust Height has one fixed hanger arms and clamps directly onto a deck railing no larger than 2 inch wide. This adjustable Deck Pole is 46 inch tall overall and its hanger arm has a 9 inch curved reach. 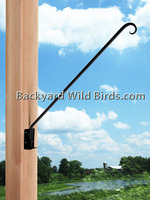 Deck Pole Baluster Mount is made to hang bird feeders on wider Balusters approx. 1" square like on vinyl, composite or wood decks. This a very strong shepherd staff pole is perfect for large birdfeeders or heavy hanging plants. Deck Pole Bird Feeder Swing Arm is a long deck hook pole with a clamp bracket that is specially designed to hang bird feeders outward and off your deck with a 29 inch horizontal reach. 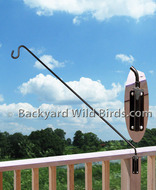 Deck Pole Duo Hanger Arm is a deck bird feeder pole with two 12" hanger arms. This 44" tall 1" diameter deck pole mounts on a deck railing that is less than 2“ thick. Deck Pole Iron Railing Mount is made to hang bird feeders on narrower approx. 1/2" square balusters like on iron railing decks. This a very strong shepherd staff pole perfect for large birdfeeders or heavy hanging plants. 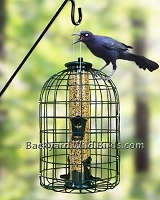 This Deck bird feeder pole has a 27" Swing Arm pole and a large capacity metal Sunflower Seed Mesh Bird Feeder. The long reach Deck Swing Arm is designed to hang a bird feeder outward and off your deck. The metal wire mesh is just the right size for Sunflower bird seed. Deck Wrought Iron Bracket Arm is a 32 inch hanger arm bracket. The strong bracket arm is perfect for hanging plants and also bird feeders. The bracket is heavy duty wrought iron arm that is mounted on a standard 2x4 deck rail. Extended Deck Pole Swing Arm has a 36" extended reach swing arm to mount your bird feeders on and is one nice strong deck bird feeder pole. The deck pole has an thumb screw to mount to a standard 2x4 deck rail. Extended Deck Pole swing arm has a 36" extended reach swing arm and a clear 16" weather baffle ready to mount your bird feeder on. Extended Deck Pole Squirrel Proof Bird Feeder is designed to hang the included metal cage squirrel proof bird feeder 36 inches off your deck. Great for serving sunflower or mixed seeds. Metal grid blocks squirrels, Grackles and black birds. Hanger Arms Quick Connect are 2 Arms for 1/2" vertical Square steel Staff. Designed to twist on and be cantilevered on our 1/2" or 7/16" Square Staffs. No tools required! The two arms are each 8" long and are meant to provide extra light duty arms.